We are proud to welcome Rev. Dr. Charlie Lee to Starmount in February of 2018! Charlie is a native of Asheboro, NC and grew up attending First Presbyterian Church. He is a graduate of the University of North Carolina in Chapel Hill. After his time there, he served as the full-time program director for a Christian Camp & Retreat Center in Oxford, NC called Camp Oak Hill. He then attended Wake Forest University Divinity School. In 2015, Charlie received his Doctorate of Ministry degree from McCormick Theological Seminary in Chicago, IL. Before coming to Starmount, Charlie was Associate Pastor at First Presbyterian Church in Wilmington, NC. He has served in this call for the last 12 years and has been blessed with the opportunity to work in many different areas of ministry within the same congregation. He began serving in the areas of youth ministry and missions. A highlight of this season of ministry for Charlie was the opportunity to lead and serve on mission trips to places like Mexico, Jamaica, Haiti, and China. The faith formation that took place during these trips, especially among the youth, was something that Charlie found particularly meaningful. He eventually transitioned to a broader leadership role focusing on growth, new members, worship, and administration, while continuing his mission work. 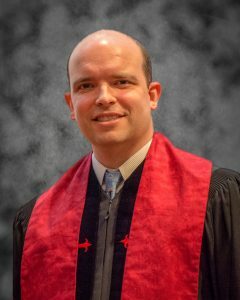 When First Presbyterian Church entered into its own time of pastoral transition, they called upon Charlie to serve as their Interim Head of Staff, a position he held for two years. During this transition period under Charlie’s leadership, the congregation made significant progress towards accomplishing their strategic goals. Charlie is blessed with a rich family life with wife Lindsay, and children Jackson and Eliza. Charlie and Lindsay are high school sweethearts and lived in Greensboro when they were first married. Lindsay graduated with a nursing degree from UNCG and has worked mostly in the areas of Hospice and Oncology. She just completed a master’s degree to become a Family Nurse Practitioner. Jackson is in the 7th grade and enjoying Middle School. He also enjoys playing basketball and soccer. Eliza is in the 4th grade of a Spanish Immersion Elementary School. She also plays basketball and enjoys singing in the Girl’s Choir of Wilmington. The Lee family is not complete without their two lovable dogs, Lacey & Finch. Kathryn Campbell grew up in Central New Jersey. After a short-lived career in athletic training at Hope College and the University of Minnesota, she was hired and began work as Coordinator of High School and College-Age Ministries at Westminster Presbyterian Church in Minneapolis. It was during that tenure that her career path shifted and she started at Luther Seminary in Saint Paul. During her studies toward her Master of Divinity, Kathryn served as Youth Ministries Coordinator and Pastoral Intern at a church in Shoreview, Minn. Prior to her call to Starmount, Kathryn served as Coordinator of Children, Youth, Young Adult, and Family Ministries at a church in Roseville, Minnesota. Kathryn graduated in May 2017 with her Doctor of Ministry degree from Western Theological Seminary, where the focus of her degree was “Evangelism as Care: Four Christian Practices for the 21st Century.” In her spare time, Kathryn enjoys spending time with her husband, Austin, and their daughter, Avis, cooking, and playing soccer and watching sports of all kinds. Starmount Presbyterian Church is a wonderful extension of my family - they are truly supportive of my call as Christian, pastor, wife, mother, and friend. I am blessed to work and serve a congregation that challenges me to continue to grow in my faith in Jesus Christ and serve Him through mission and ministry. Rev. 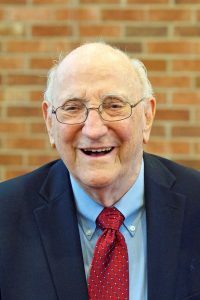 Dr. George Carpenter served Starmount for 14 years as senior pastor before serving as Pastor Emeritus. Beloved then and now, here is George’s “story” in his own words. Meridian MS was “home” for all the fun younger years. Then off to Maryville College for a super four years and preparatory experience. Majored in English/music getting ready for the next step. Louisville Seminary was a superior experience to train me for all that was to come. The Lord was wonderful to me; I met a young lady in the college group, Carol Grall and never looked back. The senior year at seminary we were married and called to begin work in Louisville with a mission of Louisville Presbytery. It worked! The Lord helped the church grow, build two buildings and love those people. Bardstown Road church in Louisville sent representatives each Sunday until we knew the Lord was moving us to new pastures. Following those years in our first parish God called us to serve another congregation in Louisville at Bardstown Road. While there we had the honor of starting the Highland Community Ministries, linking all the churches in the highlands to work together on mission. 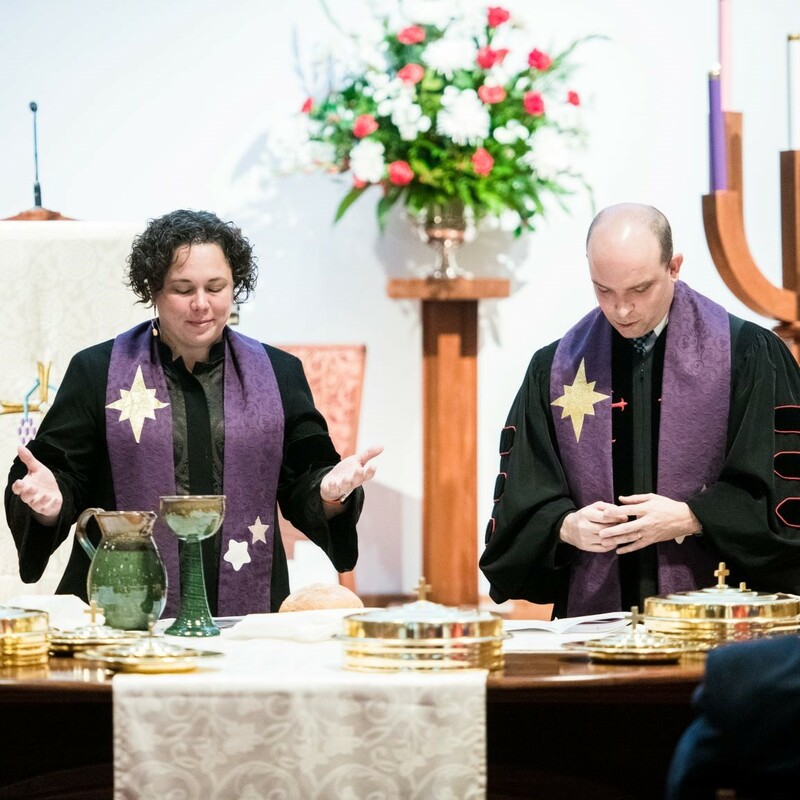 The congregation at First Presbyterian in Greensboro came answering the next call, making us listen to come and serve on that staff for about five years. During that great time we came to know the people at Starmount. The congregation at Starmount heard the calling of our Lord and were wonderful in giving us that blessed call. Those were meaningful years for all of us: serving on presbytery committees, working on the board at Humana Hospital, Greensboro Urban ministries, Goodwill, and our beloved Starmount. All those great times were followed with a call to go into mission with MBF, medical missions with trips to Africa, Europe God wanted me to come back to the US and called us to do interims. After five we loved, the time came for retirement. In the wonderful love of that Starmount congregation, we were given the honor of becoming the Pastor Emeritus. God is fantastic, for sure. Still loving and worshiping with our loving congregation.